Note: Surface Dial communicates via Bluetooth LE, and requires Windows 10 Creators Update or later. 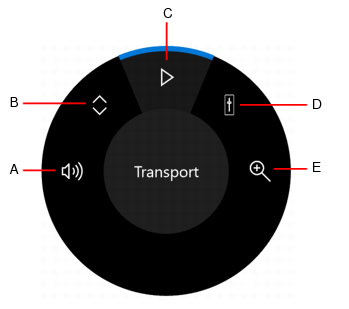 Cakewalk has integrated support for Windows wheel input devices such as Microsoft’s Surface Dial, which is a hardware device that provides tactile control of various actions like controlling the transport, adjusting knobs and controls, and zooming. It provides a great workflow when used in conjunction with a mouse, pen, or multi-touch. Surface Dial is an accessory that is intended to be operated by your non-dominant hand as a secondary input device, while using your dominant hand for primary mouse, pen, or touch input. Using both hands simultaneously allows for a more natural experience. After pairing Surface Dial with your computer, there are no additional setup steps required in Cakewalk. Press and hold. Press the dial down and hold. This gesture opens a radial menu that lets you select a mode to use when rotating the dial (see To select a mode). Rotate. Turn the dial left or right. The function is determined by the current mode. Cakewalk supports acceleration when rotating the Dial, and responds faster or slower depending on how fast you rotate the Dial. Click. Press the dial and release, similar to a mouse click. This gesture starts and stops the transport. Surface Dial vibrates in order to provide haptic feedback when rotating the dial. Haptic feedback can be disabled under Windows Settings > Devices > Wheel. Press and hold Surface Dial to open the radial menu. Rotate the dial to highlight the desired mode, then click to select the mode. Cakewalk supports the following custom modes. 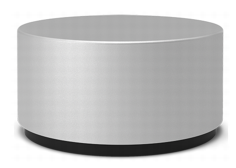 Note: Surface Dial can be used on a table or placed directly on a touch display with supported devices such as Surface 5 and Surface Studio. When used on a touch display, the radial menu surrounds the Dial. If you are using the Dial on a table and using multiple monitors, the radial menu will open on the primary monitor by default. You can drag to reposition the radial menu. Click the Dial. This works in all modes. Press and hold the Dial to open the radial menu, then select the Transport mode . When playback is stopped, rotate the dial left or right to adjust the Now Time. Press and hold the Dial to open the radial menu, then select the Control mode . Using a mouse or touch, click the control you want to adjust, then rotate the Dial. Note: You can adjust the control value of any Cakewalk control that shows an on-screen focus rectangle. The control must live in the main Cakewalk window, and not in a floating window. Plug-in parameters are currently not supported. Press and hold the Dial to open the radial menu, then select the Zoom mode . Rotate the dial left to zoom out horizontally, or right to zoom in horizontally. After Surface Dial has been successfully paired with your computer, you can customize the default settings, including tools, vibration (haptic feedback), and writing (dominant) hand, under Windows Settings > Devices > Wheel.